ICTO - FAQ » Student Mail » UM@Connect » How to apply UM@Connect? If you have set auto-forward in On-Premises email account previously, the auto-forward will be switched Off after registration. “Enjoy UM@Connect 4 hours after application, your UM@Connect account will be activated. 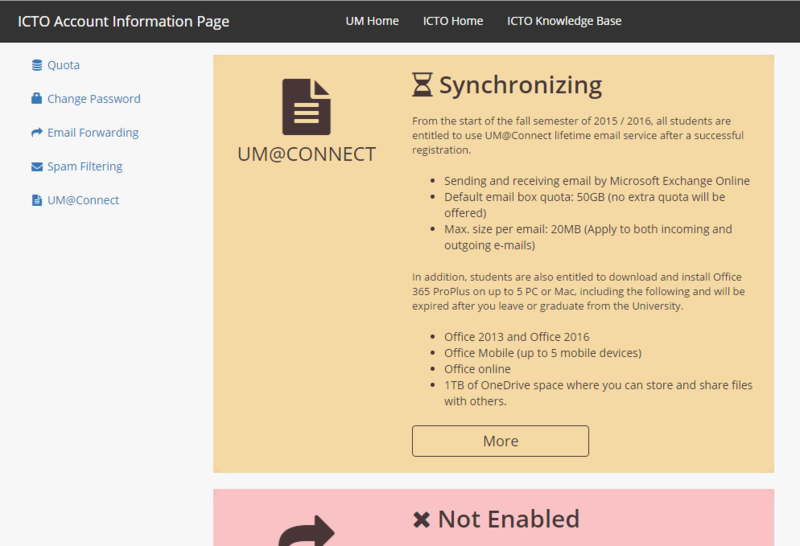 Please login to UM@Connect by http://webmail.umac.mo. All emails sent to @umac.mo and @connect.umac.mo will be delivered to your UM@Connect account. 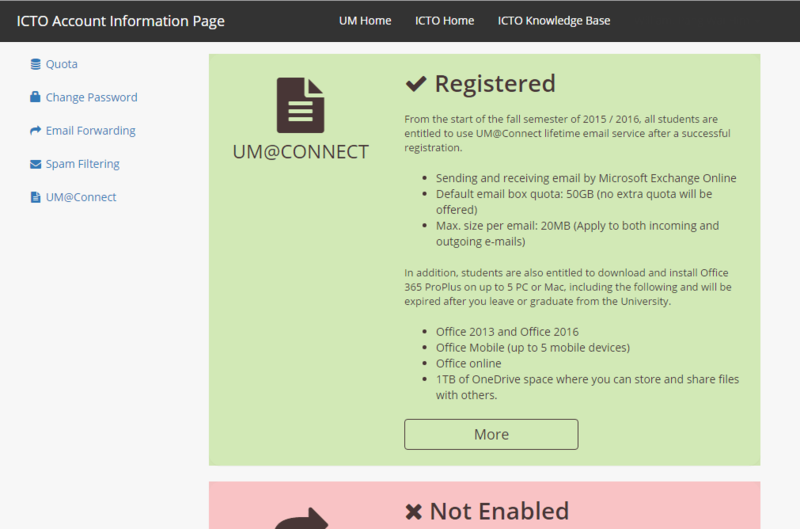 By completed the application of UM@Connect, student are also entitled to download and install Office 365 ProPlus. The right will be expired after you leave or graduate from the University. 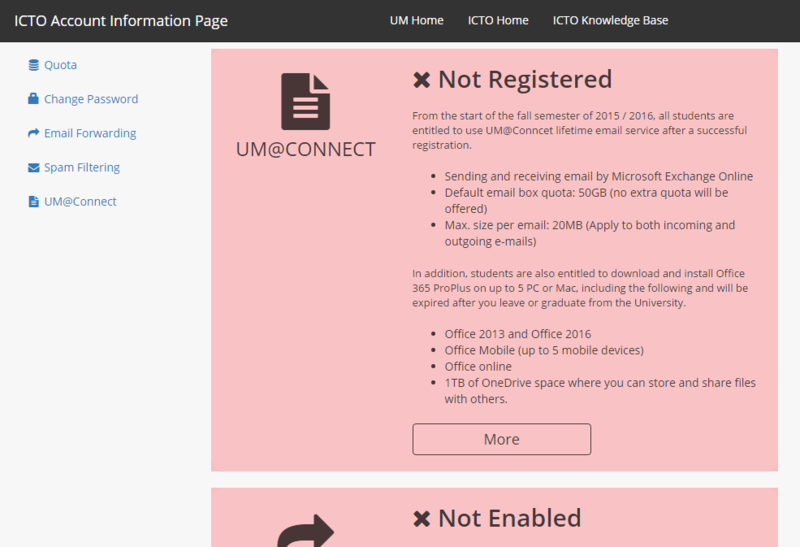 Student who want to apply Office 365 ProPlus only instead of apply UM@Connect, please contact icto.helpdesk@umac.mo for further arrangement. After reading the user agreement, you need to agree it by checking [I agree to the above user agreement], input your [PC LAN password] for confirmation and click [Register]. Please be patient to wait about 4 hours to synchronize the account data to UM@Connect. The status will become [Registered] when the synchronization is complete as the following screenshot. Please proceed to the rest of this tutorial. After 4 hours, the setup would be completed. All emails sent to @umac.mo and @connect.umac.mo will be delivered to your UM@Connect account.